Some Hedge Funds and retirement plans have made a fortune by purchasing Apple's shares. 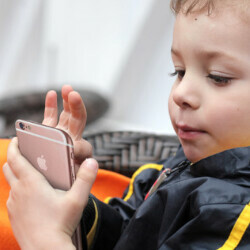 Despite relying on Apple to continue selling huge numbers of iPhone units to keep the stock moving forward, some of these funds are asking Apple to come up with some software that will allow parents to lower the amount of time that their kids spend using the device. Two such pools of money, Jana Partners, and the California State Teachers’ Retirement System, made their requests known in a letter they penned and mailed off to Apple this past Saturday. The two funds together own about $2 billion of Apple stock, according to the Wall Street Journal. The letter has been published online at thinkdifferentlyaboutkids.com. In the letter, studies are quoted including one that showed a link between heavy smartphone usage by kids of a certain age, and a higher risk of suicide. Sleep deprivation is also mentioned as a risk for teens using smartphones for more than 5 hours a day. And kids who spend too much time perusing posts on social media are more likely to battle depression. In the letter, the two funds write that if Apple can start giving special attention to the next generation, it would not only be good business, it would also be the right thing to do. The funds want Apple to try to determine what would be considered optimal usage of the iPhone, and come up with an easy way for parents to set usage limits for their kids' iPhone handsets. Shouldn't this be the responsibility of the parents? Exactly, that is up to the parents not Apple or any other maker. Health is wealth. This should apply to all phones, and kids parents should see to it. Kids today, are too lazy, and the childhood obesity and diabetes rates reflect that. It's now 2018 and everyone wants to place the blame on others when things go wrong. The parenting starts with the parents...they are the real problem here. Best thing to do is teach by example...maybe the parents of the world need to drop Facebook when little kids are in the house? That's why I said "and kids parents should see to it". there just phones jeez. Pretty sure they more time on a ipad, laptop or desktop. Phones only 1 or 2 tops. so in other words, they want Apple as a company, to do their job as parents...got it. I think its more of the fact there are no options for parents to set limits within iOS or even a 3rd party app. There are plenty of options with android tablets/phones to limit screen time. Being the father of two boys, I would NEVER leave something like this in the hands of technology. It's mine and my wife's responsibilty to moniter, set, and enforce rules regarding their usage of phones and tablets. Not Apple's...or any other oem.